So, my good friend Neal has been living in Rome for the last year and (thanks to the marvelous wonder that is modern technology) we are able to chat frequently. I love hearing about his adventures in the land of romance, and he’s always checking in to see what’s cooking up in my kitchen. One morning, I happened to catch him at the end of his day (Italy is 9 hours ahead of California) and he was in the kitchen making pasta all’arrabiata (which literally translates to “angry pasta”). Naturally, I whipped out my notepad and took notes! The secret of the sauce is to simmer it to concentrate the heat and tomato flavor. So here it is: a spicy Italian pasta recipe straight out of a little cucina Italiano! 1. Prepare the sauce. In a large bowl, crush the tomatoes by squeezing them by hand. Set aside. In a large skillet or sauté pan, heat 2-3 tablespoons of olive oil, enough to cover the bottom of the pan. Once the oil is hot, add the garlic and red pepper flakes and cook until the garlic is golden. Add the crushed tomatoes (the pan will sizzle! ), then cover and simmer for 20 minutes, stirring occasionally. 2. While the sauce is simmering, cook the pasta in a large pot of salted water until “al dente,” about 9-10 minutes. It should be firm to the bite, but not hard. 3. Reserving 1 cup of the cooking water, drain the pasta when done and add to the tomato sauce. Add in some of the reserved water if needed to loosen the sauce. Toss in a handful of roughly chopped basil. * You can use pre-crushed tomatoes, but I prefer whole ones since they hold their flavor better in the can. 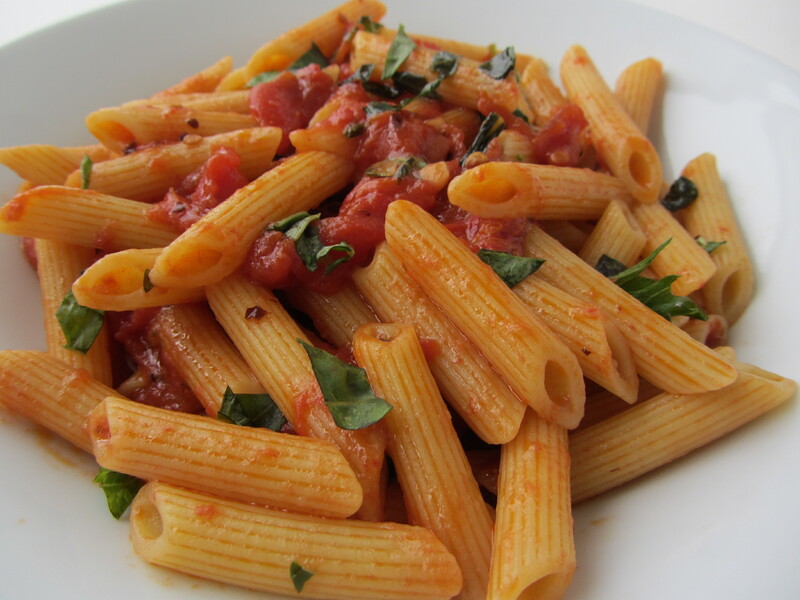 * Any pasta would work for this, but penne is best because its tubular shape will hold alot of the sauce. yum! gonna try it soon! the last thing of yours i tried was the fancy french toast! my man and i love your recipes, never any left-overs. thanks for adding a little spice to our lives! You’re welcome! I’m glad my recipes are being put to good use!